The following are from animated shorts/pilots that were collected in animation showcases or "incubator" series like Random! Cartoons. Too bad they were just one-shot cartoons, and were never given their own series. Lacey Shadows from The Modifyers. The setting is a mix of Steampunk and British Mod, both rare yet amazing themes. 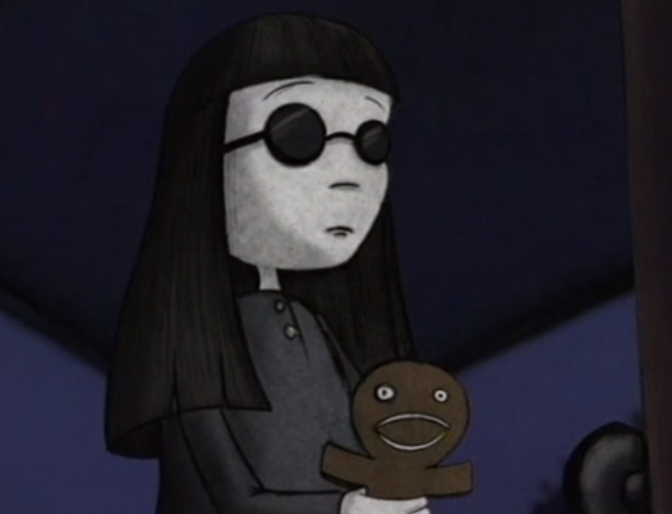 And the show's art style is just as Gothic and quirky. Lacey works for the creepy Baron Vain who lives under a cemetery in stealing precious artifacts. She is his favorite henchman, unlike the dirty rat, Runt. 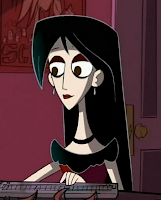 But actually, goth Lacey Shadows is the preppy Agent Xero. She's a master of disguise, and together with her modular partner, Molly, a part of a secret mystery cracking team known as The Modifyers. She disguises herself as Lacey Shadows to foil the evil plans of Baron Vain. Rosemary from Kyle + Rosemary. It's about teenage romance that started in the online game Quest World. Kyle is a geek and a knight who falls in love with a dark sorceress named Lunarella. 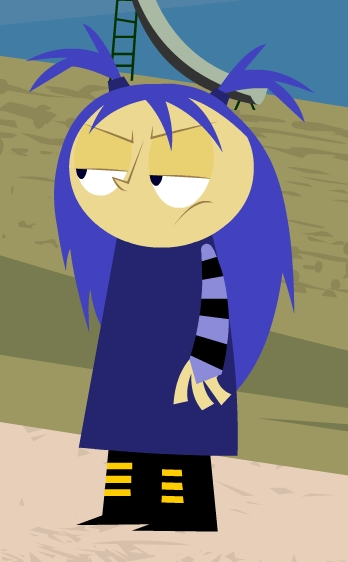 She's actually Rosemary, a member of the Goth group. Though she has friends, Rosemary still feels alone and different. But when she's in Quest World, she's free and can be her real self. Since the geeks and goths hate each other, Kyle and Rosemary only meet in Quest World. Only later has Rosemary found out and told Kyle of their true identities. At prom night, they show up as the other's social identity in the name of love. Ebola from Deadtime Stories. This was shown in MTV. It is about a girl who has recurring nightmares, and a reflection that talks back to her. When she was younger, Ebola was diagnosed with insanity. Now, her reflection tells her to avoid talking about her terrifying visions (or reality?) to her parents, as so she wouldn't get locked up again. In this failed pilot, she suspects her neighbors torturing their little daughter, and goes to discover a much horrifying secret. The animation is low-budget, yet it's effective in producing this atmosphere of dread. I really wish MTV gave it a go. Claire from The Summoning. First to be showcased in GO! Cartoons. Claire is a mean and moody witch with a pet kitty named Edgar, who's more like a pesky little brother. She needs troll fat for her sinister brew. This would summon a demon named Scaroar, so she can eliminate a certain scum in her life, which is actually the bathroom. 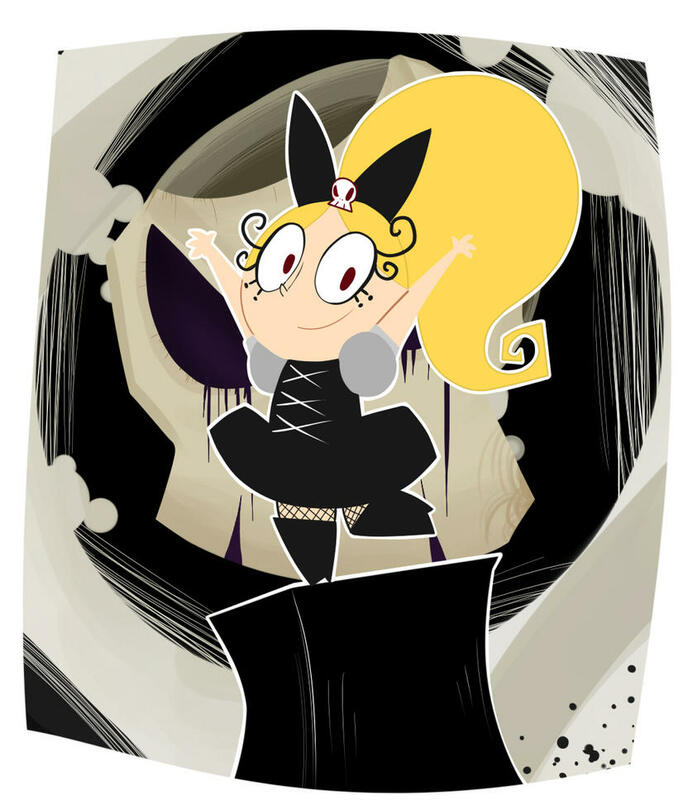 Channel Frederator greeted World Goth's Day with her character sheet. The art style is like a mix of Adventure Time's soft shapes and Flapjack's creepy exaggerations. 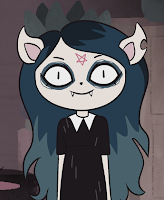 I also notice Claire dresses like a Nu Goth. Tess from Girls on the Go. Also about teenage crush and shown in Random!. 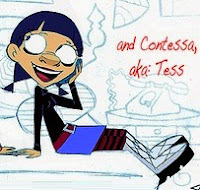 Tess is Kat's more knowledgeable Goth best friend who teaches her the rules on how to date a guy (from a magazine). But Kat's admirer, "Spencer", turns out to be some pudgy geek who ends up with Tess after all. Tess sleeps upside down on a tree with her pet bat, and creates pungent love potions using toenails. Gloom from Sparkles and Gloom. Set in a fairytale world where goody cutesy things live together with the dark forces of evil. Sparkles and Gloom are the daughters of Prince Charming and the Evil Witch. They both attend Geevil School where creatures of both sides are encouraged to be friends. But chaos usually happens especially between Sparkles and Gloom. In the episode, they quarrel so badly that their powers are switched. Hence, Gloom is forced to join the puffy ballet group for the talent show. While Sparkles has gone Goth, and joins Gloom's boney rock band. Anemia from Anemia and Iodine. The show is from the old Nickledeon cartoon, KaBlam!. Anemia is a Goth girl cat who loves the mystical and supernatural. Her room is full of books and potions, and a skull named Muriel. Anemia's best friend is a skater girl named Iodine. 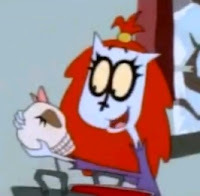 In the episode, they enter Malaria Manor to conduct a seance, and free the cat ghost that haunts its walls.